Amid a decline in both U.S. and worldwide PC shipments, Apple has also seen a slight drop in its U.S. PC shipments in 2Q15, according to shipping estimates released today from Gartner. Apple shipped 1.92 million PCs during the second quarter of 2015, down from 1.97 million in 2Q14, marking a 2.5 percent decline. Overall PC growth in the United States during the quarter was down 5.8 percent, with total estimated shipments at 15.1 million, down from 16 million in the year-ago quarter. With the exception of Lenovo, all of the top U.S. PC vendors saw declines in growth. In the U.S., PC shipments totaled 15.1 million units in the second quarter of 2015, a 5.8 percent decline from the second quarter of 2014 (see Table 2). 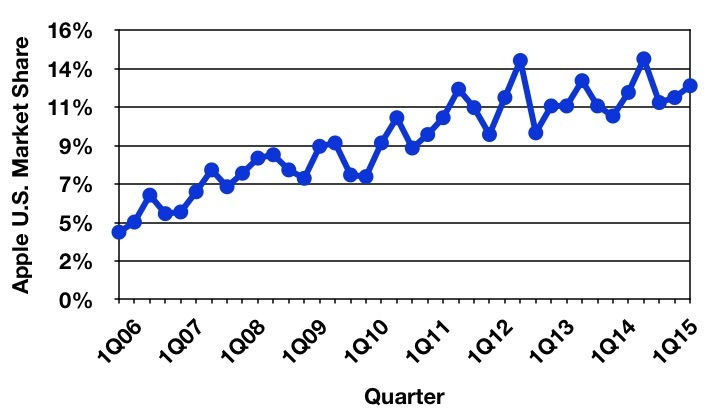 The decline was led by a double-digit decline of desk-based shipments, which offset single-digit growth of mobile PCs. Based on preliminary results, the desk-based PC shipment decline was the steepest since 2009 when the market was hit by the economic crisis. During the quarter, Apple captured 12.7 percent of the market, up from 12.3 percent in 2Q14. Apple was ranked as the fourth largest PC vendor in the United States in 2Q15, based on Gartner's estimates, trailing behind HP, Dell, and Lenovo. Market leader HP shipped nearly 4 million PCs during the quarter for a 26.2 percent share of the market, while Dell shipped 3.9 million for a 25.6 percent share of the market. Lenovo came in just ahead of Apple with 2 million PC shipments and 13.3 percent of the market, while Asus brought up the rear with shipments of 767,000 and a 5.1 percent share of the market. IDC has also released its own estimates of Apple's U.S. PC shipments during 2Q15, which are quite different from Gartner's estimates. According to IDC, overall U.S. PC shipments totaled 16.4 million, a 3.3 percent decline from 2Q14's 17 million. According to IDC, Apple shipped 2.2 million PCs during the quarter, for 13.5 percent market share and 11.9 percent growth year over year. Gartner and IDC often have different numbers because each company counts different products in their PC totals. Apple does not rank as one of the top five worldwide vendors in Gartner's data, which ranks Acer and ASUS above Apple, but in IDC's data, Apple ranks higher than Acer/ASUS and is counted as the number four worldwide PC vendor. IDC's data suggests that Apple's worldwide PC marketshare climbed to 7.8 percent in 2Q15 with 5.14 million shipments, while Gartner's data suggests Acer was the number five worldwide PC vendor with 4.5 million shipments. According to Gartner, worldwide PC shipments during 2Q15 totaled 68.4 million units, a 9.5 percent decrease from 2Q14. IDC's estimates, meanwhile, point towards 66.1 million shipments during the quarter, a 11.8 percent drop from the year-ago quarter. It's important to note that data from Gartner and IDC is preliminary and that the numbers can shift somewhat, sometimes dramatically. Last year, for example, Gartner predicted Apple shipments of 1.68 million and 10.6 percent market share in 2Q14, a number that was later revised to 1.97 million shipments and 12.3 percent market share. Update 2:40 PM PT: We've updated this post to add data from IDC. See what happens when you gut the Mac Mini? Apple did themselves no favours launching the 12" MacBook. That is a worrying sign for the direction of the Mac. When form takes precedence over function, as it does with the ridiculously compromised MacBook, you might as well stop making computers. Apple are becoming a fashion-driven company, and are doing their best to destroy the hard-earned reputation for stellar hardware which Steve Jobs built up over many years. It's sad to see this once-great company turn into a political blancmange obsessed with race and sexuality at the expense of a laser-focus on their products. Sorry guys, it's all my fault. Was gonna buy a mini but the wife said no. Simple equation. Lack of substantial hardware upgrades in last 2 years = no reason for me to replace my 15" 2013 retina mbp. Soldered memory, downgrade "refreshes", deceptive shell-game pricing, unnecessary profit margin/cost cutting design decisions, and resulting lowered sales. All predicted when it was announced a bean counting numbers guy was appointed CEO. Now, to try and improve lagging sales figures, which was caused by the bean counting in the first place, the typical numbers guy move will be to double his bean counting efforts, resulting in even worse sales, and so it goes until the company is driven into the ground. I haven't purchased a Macbook Pro nor iMac, and dissuaded family/friends from doing so, since the idiotic soldered memory decision alone, and my plans to update/replace my various 2011 Mac Mini did not happen after seeing how it was castrated. Lost sales due to a numbers CEO. People are becoming more and more critical of Tim..... Unfortunately stock value is high, not because of his leadership but because of past products. I hope he gets the toss before he just turns Apple into HP.